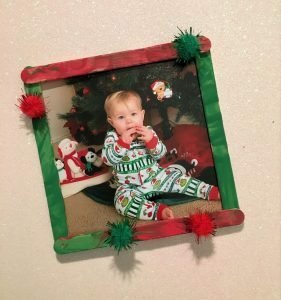 A toddler made Christmas gift is so cute! The grandparents will absolutely love it. 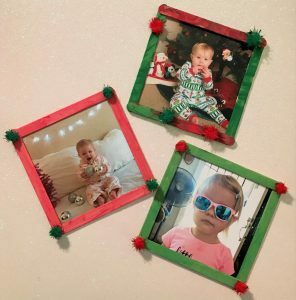 Try this easy Christmas popsicle stick frame craft. 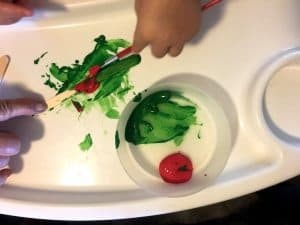 Easy enough for a toddler to make and you can pick up all the supplies at the dollar store! My toddler’s version actually came out much better than the ones I made! 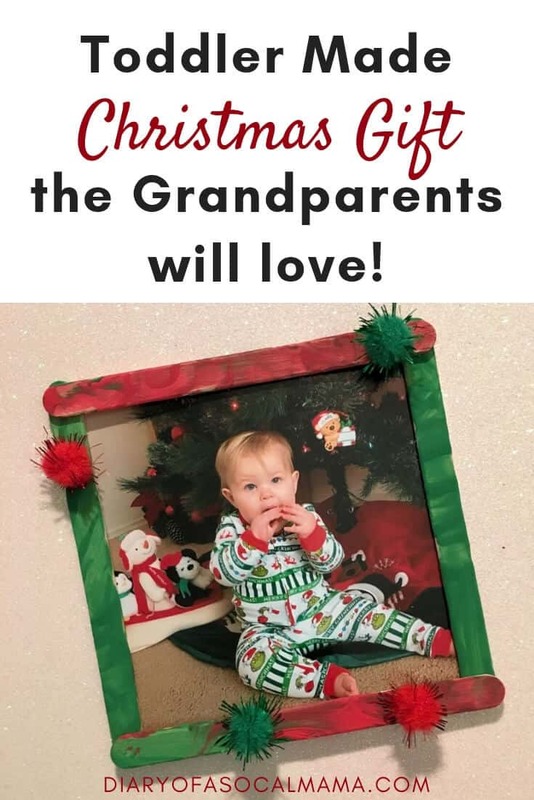 Make this easy and simple dollar store toddler craft and make the grandparents smile on Christmas morning. Or use it as a memento for yourself. You can easily turn it into a magnet or Christmas tree ornament too! I was able to pick up all these craft supplies at the dollar store for under $5 but you can buy them online as well. 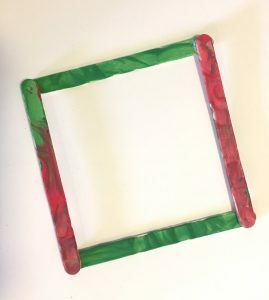 Paint 4 popsicle sticks per frame. I could only get my 22-month-old to paint 4 sticks before her attention gave out so mama had to paint the rest lol. Once the sticks are dry glue them together to create a square frame. Allow the glue to dry. Now it’s time to decorate. 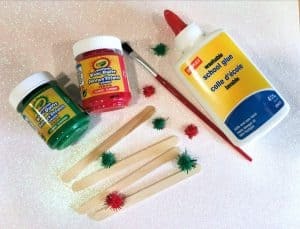 We used Christmas craft pom poms but you could also use glitter, stickers, or sequins to jazz up the popsicle stick frames. Use glue or tape to attach the photo. I honestly found scotch tape to be easier. It was faster and you don’t have to worry about trying to get the glue to stick as the back isn’t completely flat. If you want to turn it into a tree ornament or a magnet simply attach a piece of yarn to the stop as a hanger or magnet strips to create a magnet. Wrap it up and present as a gift. Handmade gifts are always a big hit. My grandmother still has many of the ones we made as kids around that she brings out around the holidays. They also bring up fond memories when we gather for the holidays. I can’t wait to give these ones to the grandparents at Christmas. The one my toddler did definitely turned out the best in my opinion, can you figure out which one that was lol?